Published on 18 February 2014. This sign intrigued me; I’m not embarrassed to confess that my ecclesiastical knowledge didn’t extend to understanding the word “churchings”. 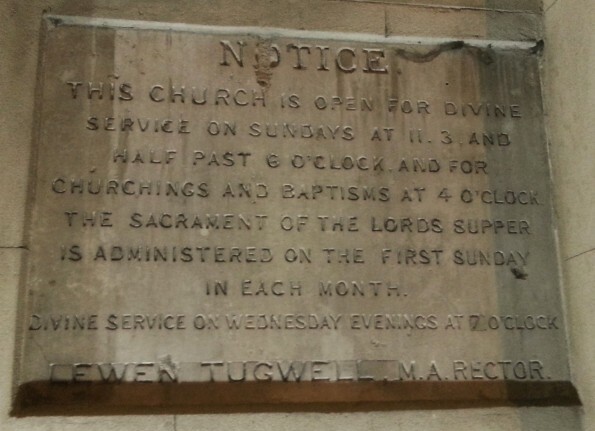 It turns out that a “churching” was a Church of England service for women who had recently given birth, thanking God for “the safe deliverance and preservation from the great dangers of childbirth”. It is no longer practised – presumably, people prefer to thank hygiene and medicine rather than God nowadays. In the late 1800s, childbirth was a dangerous business in England: about 1 in 200 births ended in the mother’s death. These days, the figure is many, many times smaller: about 1 in 10,000. Yet, unbelievably, there are some countries, like Somalia, Nigeria, Sudan, and Sierra Leone, where mothers giving birth today face a higher risk of death than those in England in the late 1800s. I wonder if they still practice “churchings”. This 2,157th post was filed under: Photo-a-day 2014, Scrapbook.